During the 2017-2018 school year, HSVMA was proud to have representation campuses across the United States and Canada with 8 student chapters and student representatives at another 14 schools. These dedicated student volunteers helped HSVMA coordinate 22 lectures, four RAVS suture labs, and one spay lab! In addition, we sponsored a shelter medicine symposium, two archived webinar viewings, a movie screening, and a trip to a farm sanctuary. Thank you to all our student and faculty volunteers who organized these events! In October, our 2017 HSVMA Animal Welfare Symposium, hosted by the student chapter at Western University, provided a day of lectures and a RAVS suture lab to veterinary professionals and students from eight schools around the country. Our generous sponsor, Wallis Annenberg PetSpace, helped us provide several additional student travel stipends this year. Six speakers presented topics including recognizing animal cruelty, access to care, and farm animal welfare. In February, HSVMA sponsored World Spay Day clinics organized by five vet schools: Auburn University, University of Wisconsin, Western University, Tuskegee University, and Midwestern University. 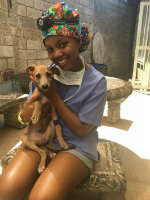 Each school either hosted a clinic on campus or worked with a local organization to provide free spay/neuter services to members of the community. The student volunteers gained first-hand knowledge of how a high-quality, high-volume clinic operates. We are finishing the school year with our third annual HSVMA Compassionate Care Scholarship for veterinary students. We have received 42 applications from students across the US and Canada vying for this year’s awards of $3000, $2000, and $1500. Last year’s winners were an amazing trio of animal welfare advocates, and I’m sure this year it will be just as difficult to narrow down the winners to three recipients. As a gift to all of our graduating students who are reading this, if you update your HSVMA member information online before August 1st, you will receive a jump drive containing pdf copies of our Wildlife Care Basics for Veterinary Hospitals and The HSUS Euthanasia Reference Manual. Thank you for joining as students and we welcome you as veterinary professionals!